WHERE DO I BEGIN!!!???? This was by far the best costume EVER. Everyone was calling me a man all night hahaha. Yes, I am a female and was dressed as Zoltar. All I kept hearing was “that dudes costume is neat”… My costume was made out of pvc pipe, poster board, shelf liner, duct tape and velcro. I did have a mega phone to help with the sound… Yes!! 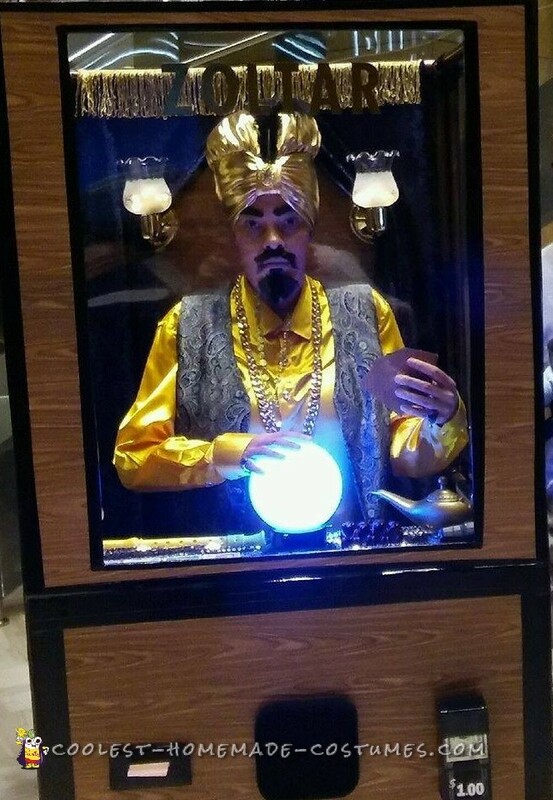 Zoltar even speaks…. This costume took me about a month to build… It was fun building even though I had to redo parts a lot of times because I came up with better ideas.. This was my 2016 costume… I am currently in process of my 2017 costume and will reveal it on Oct. 27th… I keep my costumes hidden to avoid copy cats hahaha. If you like this costume wait til you see what I have coming for this year…..keep an eye out to be continued…..